April has seen four of our School Food Matters Food for Life Award schools enjoying the first of the summer sun during a morning of gardening training with Food Growing Schools London, kindly hosted by Bousfield Primary School. Trainer Paul Sadler ably explained, amongst other topics, the finer art of composting to teachers from Bousfield, St Barnabas & St Philips, Colville and Our Lady of Victories – much to everyone’s interest. Composting with children is a key component of being a Bronze Food for Life Partnership Award holder. 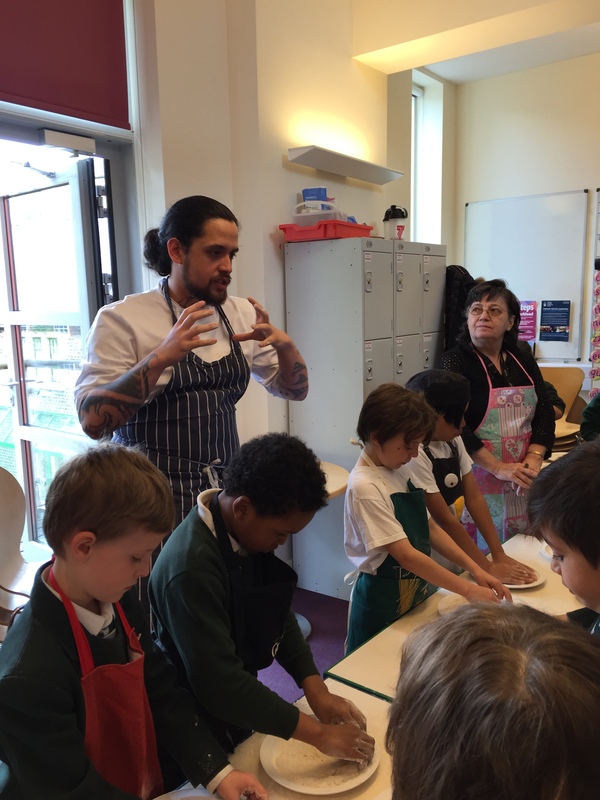 Head Chef of Daylesford’s Pimlico store, Dalra Epiha, visited St Joseph’s RC Primary and ran a very entertaining Cooking Ideas session for fourteen Year 3 students who created mini pizzas from local, seasonal produce including Daylesford’s own cheddar cheese! St Joseph’s were delighted to hear this month that they have been awarded Bronze and their school business manager has started the new KS2 gardening club during Friday lunch times. They are well on their way to their goal of a Silver Award. Finally, Isla met with the Kensington Food Growing Network to give an update on progress and to talk about how we can join up with other food education projects in the Borough.